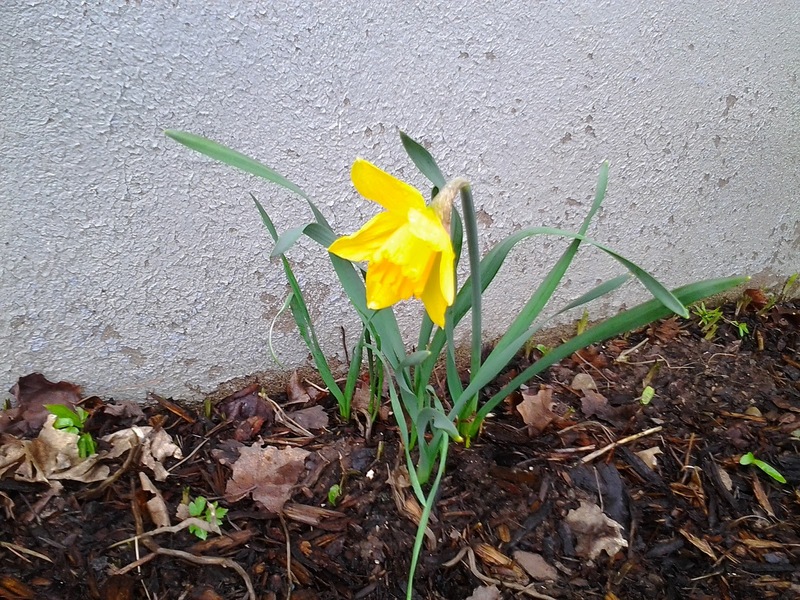 This daffodil bloomed in our front yard April 24th. I love getting my hands dirty, literally, dirty. The smell of ground in topsoil and mud on my hands sends my olfactory senses into overdrive. My memory bank kicks into gear and sends me back to when I was a kid. My friends and I would dig holes into a exposed hillside and stick our action figures in, then we'd retreat to the bottom and toss bombs (rocks) at one another's man to see who could knock whose out first. We'd entertain ourselves for hours doing this. We'd be covered from head to toe in dirt and dust and we'd be hungry and thirsty. From the eroding bank we'd sneak up to the garden and get ourselves some peas and carrots to snack on and we'd wash them in the hose. When I get my hands dirty I go back to being a kid. Whenever we get the chance my wife and I try to make sure our kid's hands are dirty. Recently we just planted our first vegetable garden and they worked hard helping us prepare the ground and to plant the seeds. I honestly thought "It'll be tough keeping them focused long enough." It turned out I was wrong and as long as they kept finding worms to rescue, they kept right on digging and planting. Our garden is not huge but it has 2 rows of peas, 2 rows of beans, and 2 rows of carrots. Each row is about 8' long and spaced about 30" apart, which is what the instructions on the seed pouch indicated was appropriate. The last time I worked in a garden I was just a kid and didn't really pay attention to the details. There was slightly more to it than simply plugging the seeds in the ground. I created a spacing and depth stick for each of the kids and they used the stick to create a "planting pocket" for each seed that was the right depth and space from the previous seed. Each seed has different spacing and depth requirements. The peas, it was suggested be planted 2" deep and 10" apart, while the beans should be the same depth but could handle being only 6" apart. The easiest was the carrots as we could simply sow them in a straight row with no detail for spacing, however, my son my have gone a bit overboard in one area. The local rabbits might love us later on this summer. We've already been out a number of times as a group to weed and water our little patch of groceries and I'm sure by mid summer it will be something the kids will want to do as by then a water fight will be more appealing. The weeding is likely to be a bit of a fight but my wife enjoys that aspect and getting her hands dirty that way so as a team, we have things pretty well covered. 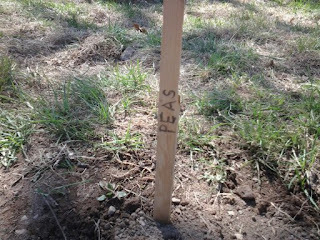 Our seeds were sowed on May 5th and by May 15th we now have peas, beans, and carrots starting to sprout in our garden. I can't wait to see how it all turns out and to eat some vegetables that we all grew together. If we have a modest crop this year I'm already making plans to expand and grow a couple more things next year. I may be getting ahead of myself as I'm not known to be a green thumb, so I will keep my dirty fingers crossed in hopes that we can keep the dog and other animals out of our garden. With our dirty hands I think we are all living a bit more like a kid and feeling more youthful so I can see why gardening is considered by many to be therapeutic. If you have time you should check out the garden at Sussex Regional High School or the Co-op Community Garden. No doubt they'll bring back your youth. When Should Hitting Be Introduced in Hockey? So I've been following a little in the checking controversy in minor hockey. Hockey Canada is considering removing checking from the Peewee levels across all its leagues. Most of what you read seems to support the move. As a kid I didn't start playing checking hockey until Bantam (one age group above Peewee), and I don't think it had a negative impact on my ability to transition into a checking game....but.....I have no way of comparing. Just for the sake of a blog post I'm going to argue against removing checking. To be honest, I probably received more checks than I gave, and I'm pretty sure there is a video of me in high school where I took a suicide pass, Lars Eller like, and ended up on my back side, likely unconscious for a second or two. Back then though there was less attention being given to concussion symptoms so I think I only missed one shift. Not that I think Eller should have come out and played after that hit. It was a bad circumstance all the way around for him and his defense man who likely felt terrible without all the media blaming him. My Habs never recovered after that hit by the way. Why do I tell you this...well...to demonstrate that I have reason to support taking contact out of the sport. However, since, I love the game, I fear the precedence the move might set and what might happen to the game if we reduce the contact. The whole essence of sport is to compete. Competition brings out things in people, often an intensity, which helps them compete. Sometimes this manifests itself as aggression and we need an avenue to vent that aggression. My fear is that if we take hitting out of Peewee we may see the aggressive tendencies come out of players differently, mainly with the stick. In Peewee where kids are learning how to compete, if they can't stop you with their body, they can't grab you with their hands, then all they are left with is the stick. This could be further exacerbated by the fact that in Peewee the gap in development can be large so weaker players who compete not differently will do what they can to stop the player who consistently has beaten him. If you've played hockey you'll get the picture I'm laying out here. Lots of the numbers Hockey Canada is throwing around about kids more likely to suffer a concussion while playing contact hockey in Peewee is very true, but if we take it out of Peewee is not the risk then further increased at the higher levels. To further the risks if that happens, the speed at which you are hit is much harder in Bantam, Midget, etc than in Peewee so the concussion is likely to be more severe as well. I have no science to back this up but I wanted to ask the question. At first I didn't think it would make a big deal but the more I think about it and read into each side, I think, I would rather see the hitting be introduced in Peewee. If my kids don't like getting hit at that level, or I don't like them getting hit, then I still have time to get them into another sport where they can compete and not feel out of place. By the way, my oldest has three more years before he plays Peewee, so I have a stake in this discussion. Would love to know what others think so drop a comment. It was an overcast day for most of the day today yet it never really rained. I should know as I worked in the field most of the day. Around supper time the sun started to shine through and so I decided it would be a nice evening to walk down to Bill's Corner Store with the kids for a treat. My wife headed out for groceries and I got the kids ready to go down to the store. Well, the sunshine was simply the calm before the storm I guess. As we stepped out the door there was a light sprinkle. When we stopped to talk to the neighbor it turned into a drizzle. As we got to the store there was a light rain coming down and we were laughing over the fact we were going to be eating ice cream in the rain. We got our drumsticks and fudgesticks and headed back towards home. As we left the store, lightning flashed to our right and a few seconds later the thunder rumbled. The rain picked up some so we decided to wait a bit under the porch at the old school house. We sang a little and laughed a little over the ice cream mustaches on the kids faces and decided we could hustle home in the rain. The thunder and lightning picked up as we stepped out of the cover of the porch. I picked up my daughter and held my son's hand as we ran down the sidewalk. We took time to jump in a puddle or two and when we thought it couldn't rain any harder, it did. The harder it rained, the harder we laughed. We were enjoying being wet and laughing so hard that the kids didn't even have time to be frightened by the loud claps of thunder. It was a great moment where God blessed us with the ability to smile, despite the discomfort of being wet and a little cold. As we got home and into the house, I took a moment to really look at the kids. Their smiles under sopping, wet hair, were uplifting. In a word...blessed. Have you completed a marathon? Have you successfully climbed a 10,000 foot mountain? Have you found that tough geocache that had eluded you once or twice before? If so, then you have felt a portion of the pride and accomplishment that many young Scouts will feel when they complete "Operation Nighthawk." Coming up on May 24-26th upwards of 100 Scouting youth will venture into the woods around Walton Lake and take part in the 35th annual weekend adventure. The highlight of "Night Hawk", as the name suggests is the 16km, night time hike, around Walton Lake. The lake is situated in the wilderness area east of Waterford and it is true wilderness with lots of wildlife. The Scouts will hike along dirt roads with no street lights and lots of shadows. There are a series of check points where the kids, in groups of 4-6, will be tested on various skills taught through the Scout program. Their biggest obstacle will be their fear. When I was a kid it was this event that helped sculpt my comfort level in the woods, especially at night. It was this event that helped me overcome my fear of being in the woods in the dark and to control my imagination. I have been on many sides of this event. I have been a young boy who struggled to keep his fear under control as I made my way from one check point to another in the dark woods roads around Walton Lake. I have been a slightly older boy, leading the younger boys from check point to check point while still fighting my fears but trying to look "tough." I was a young man who hosted a check point and teased the young boys who came to the challenge while also building up their confidence so they could make it around the course. I was a Scout leader who tutored a Scout Troop on the skills they would need to complete the event. At every stage it was a reciprocal relationship where everyone was gaining something positive – respect. No matter what role I was playing, I always felt a huge sense of accomplishment when the event was completed. The feeling was more rewarding as a kid when I managed to struggle through the 16km loop around the link and hike through the night and make all the check points. Even if my group didn't win the challenge, I still was a huge winner. I won a sense of self respect. I won new friendships. I won a ton of new skills and knowledge of outdoor survival. Whether it was starting a fire with 2 matches, zip lining across a river, first aid skills, or tracking skills, the check points truly provided me with assets I still use today. "Night Hawk" is a weekend long event that tests the metal of Scout troops from around New Brunswick and beyond. This year it is celebrating their 35th anniversary and it should be a great year. If you're involved in the Scouting movement you should make the effort to register and take part. 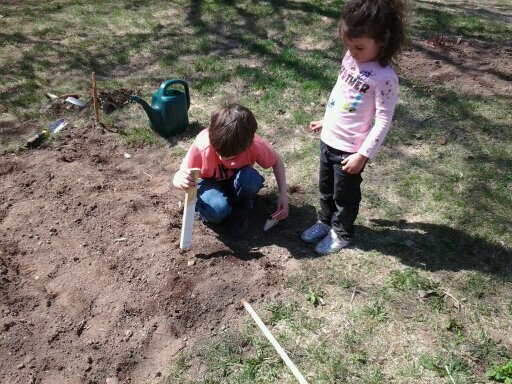 The kids were a great help spacing and sowing the seeds. It's May 4th and we have our garden planted. We have our fingers crossed that we aren't too early and that the frost is done for now. When I looked at the calendar, I thought this might be the best weekend to get it done, so we did it. Since this is our first garden we have kept it small and basic. 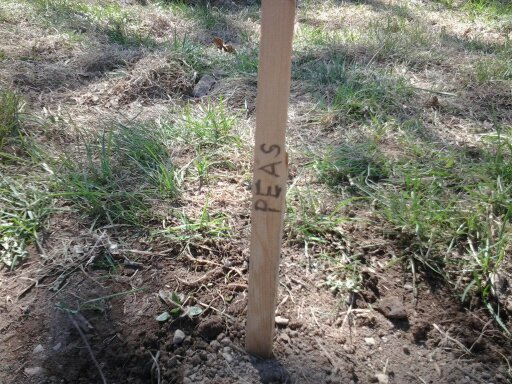 We've planted carrots, peas, and beans. The kids were a great help today and hopefully learned a little bit about work ethic and getting your hands dirty. It was a beautiful day with the temperature on the back deck getting over 30*C. Mind you that is in direct sunlight. The dog lazed around and barked occasionally when someone strolled by the house. There were no flies so it was a great day. Now though the hard part, keeping up with the weeds and watering. We are also hoping to teach our oldest child about keeping a journal. I will help him keep a garden log through power point...I hope. We'll keep you posted.